If you love the look and feel of marble bathrooms, you may want to take another look at travertine. This natural stone is also durable and it’s highly attractive. However, it carries a lower price point than marble, and that will help you save money on almost any project. The color changes in travertine are subtle, and that allows the stone to bring some extra style to a space that might be bland otherwise. The tiles can be used throughout the area, including the floor, shower walls, backsplash, and even baseboard. Once you make the decision to go with travertine in the bathroom, here are a few points you might want to keep in mind for a successful job and durable finish. Travertine tiles may be your finish of choice for the floor, but you can use this material in other key areas as well. For example, you can also purchase travertine sinks to help tie the room together. Travertine is available in tiles, and you can purchase it in slabs for the countertops. If you’re installing a custom tub that will need an apron, consider using travertine on this vertical surface to visually expand the bathroom and make it more attractive. People expect to see tiles on the floor and shower walls, but you can make more of an impact with this space by installing tiles in some unexpected areas. Use narrow tiles to add an attractive border to the mirror or windows. Install it around the floor in lieu of a wood baseboard. If there are any partial walls and room dividers in the space, travertine is a natural choice not only for style but also because it’s easy to clean and care for. The finish of the tile you use is vital. In general, you’ll want honed or tumbled stones because they give you more traction than highly polished stones. Honed tiles have a matte finish that’s very attractive and will complement any space. Tumbled tiles are commonly used in exterior applications because they have the most grip. These tiles feature an antiqued look that can add visual interest and appeal to the room. Either one will work as a bathroom floor. You may also want to consider using polished stones on the vertical surfaces like shower walls and room dividers. If you use the tiles as a baseboard or the finish for a bathtub apron, then match the finish to the adjoining floor tile. You’ll enlarge the space visually by allowing these vertical areas to blend seamlessly with the floor. Using a contrasting finish will make them stand out slightly. One of the reasons travertine is so popular is because it’s more resistant to staining. Soap scum and hard water stains typically aren’t an issue for this building material. That means that you’ll spend less time scrubbing it if you’re installing it in your own home. If you’re working on a professional project, your use of travertine will become a key selling point for homeowners who are busy and want to minimize their maintenance requirements. In general, this stone is easily cleaned by dust mopping followed with a damp sponge. Most homeowners just use a squeegee to clean their travertine showers and keep them looking sharp. As an installer, you may want to consider sealing the travertine as soon as the grout fully sets. The sealer travels down into any pores or fissures to give you an additional level of protection from stains. The travertine will be even easier to maintain, and you’ll ensure that it lasts as long as possible. You can find the appropriate sealer at most retailers and wholesalers. The sealing process should be repeated every few years to keep the stones looking their best. As a seller, you’ll make a great impression on potential customers if you’re able to tell them that the initial coating has already been applied for them. One of the top quality choices available, this stone is reminiscent of Crema River marble. It features ivory coloring with lighter and darker shades rolling throughout the stone. 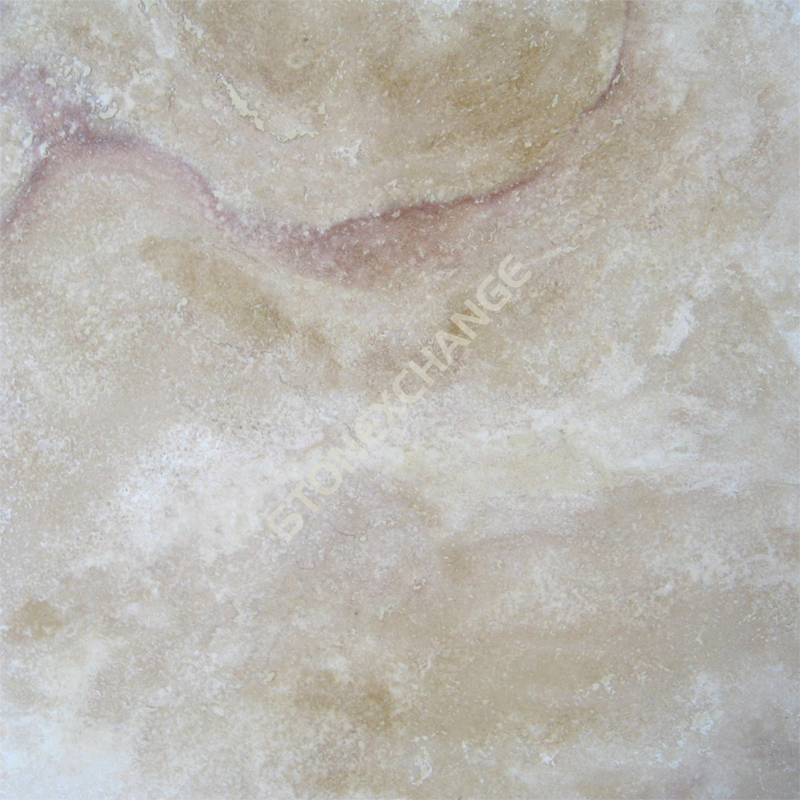 It comes from Turkey and it considered one of the finest travertine stones available. The soft colors are ideal for any bathroom, and the gentle shading with work beautifully with all decors. If you want the shading in your travertine to stand out more, then go with this beautiful option. It’s more affordable than Saturnia, and it features more color contrast. The ivory and beige background color is offset by veining in deeper shades of brown and even red. The stone has more visual movement than other options, but that helps it stand out from the competition. It has a rosy tint to it that can warm up any area that feels a little sterile, yet it will still be the perfect choice for any decorating style or theme. Regardless of the travertine you choose or how large your project is, you want to save money on every purchase. If you’ve priced this material out at your neighborhood store, you may have been discouraged by the high rates. The good news is that you don’t have to pay full retail. Whether you’re a contractor or a homeowner, you can take advantage of wholesale pricing by calling Nalboor. Unlike other stores that offer a little bit of everything, we focus strictly on beautiful stone and ceramic tiles. In addition to the tiles, we also sell the sealing and maintenance products you need to keep them looking incredible. We strive to keep our costs down, and then we pass the savings on to our valued customers. We’re able to fill orders quickly so that you won’t have to wait long to get started on your next project. Our customer service representatives are looking forward to helping you with your next order, so give us a call today and bring your dream of a travertine bathroom to life!